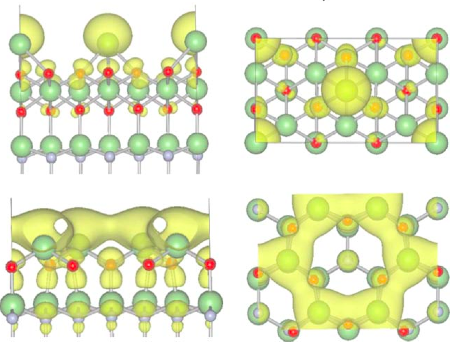 Semiconducting oxides exhibit many of the advantages of conventional semiconductors with even richer possibilities stemming from a larger diversity of structures and the availability of large single-crystal substrates for epitaxial growth. We are currently exploring several semiconducting binary oxides, such as ZnO, SnO2, TiO2, MgO, In2O3, Al2O3, and Ga2O3. We aim to understand bulk, surface, and interface properties as well as the role of defects in modifying the electronic structure. Understanding the effects of dopants and native point defects on technologically relevant properties such as conductivity in these materials is crucial towards their utilization in devices. Group-III nitrides are promising materials for light emitting devices as well as high power and high frequency electronics. Recently, intensive interest has been focused on surface and interface structures and corresponding electronic states because they greatly affect the growth and doping of the materials and the performance of the devices. We are investigating the surface structures of group-III nitrides under various physical and chemical conditions using first-principles methods. We are also investigating loss mechanisms such as Auger recombination and free-carrier absorption. 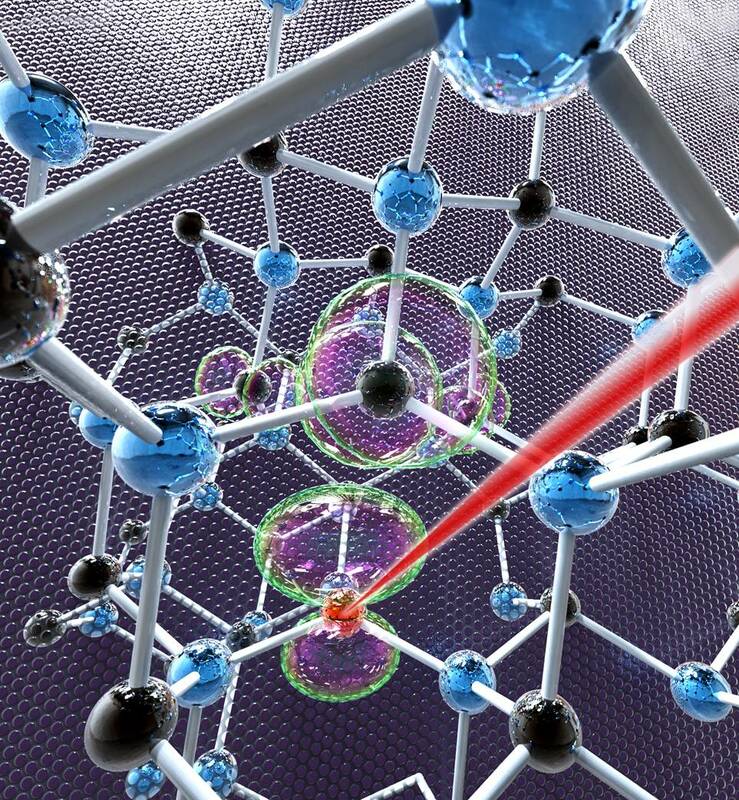 We are studying the electronic structure of surfaces, interfaces and defects in novel semiconducting materials as well as high-k gate-dielectrics. The purpose of this work is to aid in the development of high mobility MOSFETs beyond the 22-nm node, and of nitride-based transistors. 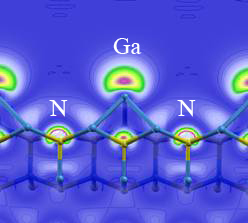 Our studies for dangling bond defects in Ge have revealed that these defects are always negatively charged, thus explaining a number of experimental puzzles. For other channel materials such as GaAs, InAs and their alloys, we are studying their interfaces with gate dielectrics such as Ga2O3, Al2O3 and In2O3. In addition, we are investigating HfO2 and ZrO2, high-k dielectrics that have recently become the subject of much experimental attention. We are also studying defect formation and its role in Fermi-level pinning at the semiconductor-channel/gate-dielectric interface. Identifying and designing physical systems for use as qubits, the basic units of quantum information, are critical steps in the development of a quantum computer. 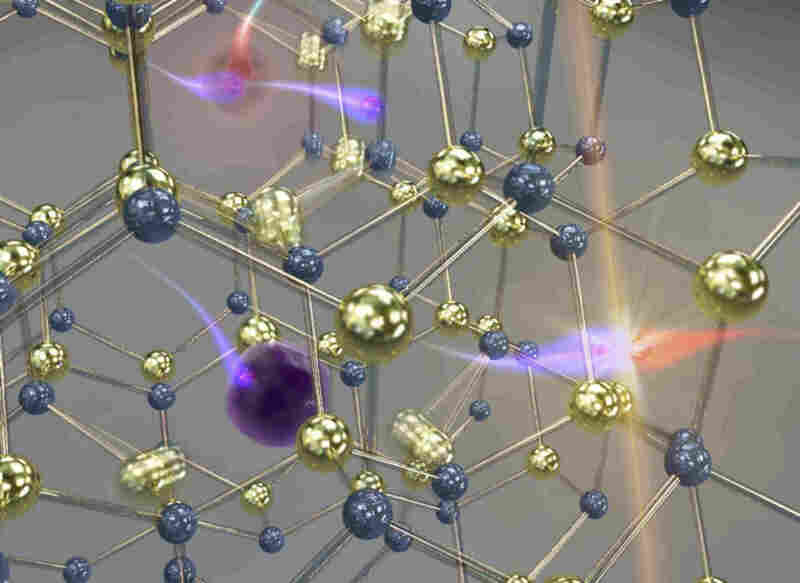 Among the possibilities in the solid state, a defect in diamond known as the nitrogen-vacancy (NV) center stands out for its robustness because its quantum state can be initialized, manipulated, and measured with high fidelity at room temperature. We have studied analogous defects in other materials as a way to develop a systematic approach to identify deep center defects with similar properties to the NV center. Currently, we are using this approach to analyze the properties of defects, their hosts, and their impact on quantities important for quantum computing, which includes spin-state lifetime, defect stability, and internal optical transitions. Rising world energy demands and increased concerns about greenhouse gases provide powerful incentives for identifying alternative energy sources. Hydrogen has the potential to serve as an energy carrier at the core of a carbon-free energy system. However, producing hydrogen, as well as storing it, is one of the greatest challenges. 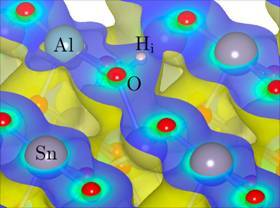 Using first-principles calculations, we investigate the mechanisms of photochemical hydrogen generation, and hydrogen desorption, incorporation, and diffusion in novel high-capacity hydrogen storage materials. Solid-state light emitters have been demonstrated as energy-efficient solutions for general lighting, display, storage, and optical communication technologies. However, such devices suffer from loss from processes that do not generate light from injected electrons and holes, such as Auger recombination and Shockley-Read-Hall recombination at defects, as well as absorption of light before it can leave the device. We are investigating these loss mechanisms from first principles in order to elucidate their microscopic origins, and provide design suggestion to mitigate their detrimental effects. 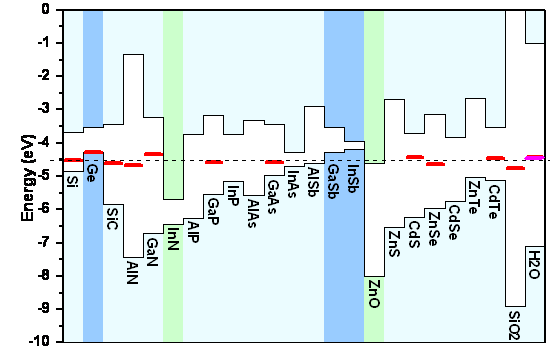 Interfaces between certain complex oxides (transition-metal perovskites) have been shown to spontaneously form a two-dimensional electron gas (2DEG) with a carrier density corresponding to 1/2 electron per interface unit cell - one observes metallic behavior at the interface between two insulators. We have been working on understanding these interfaces: Where do the carriers come from, into which material do they go, how can surface terminations play a role, and why are some interfaces insulating even though they have the carrier density corresponding to a 2DEG? 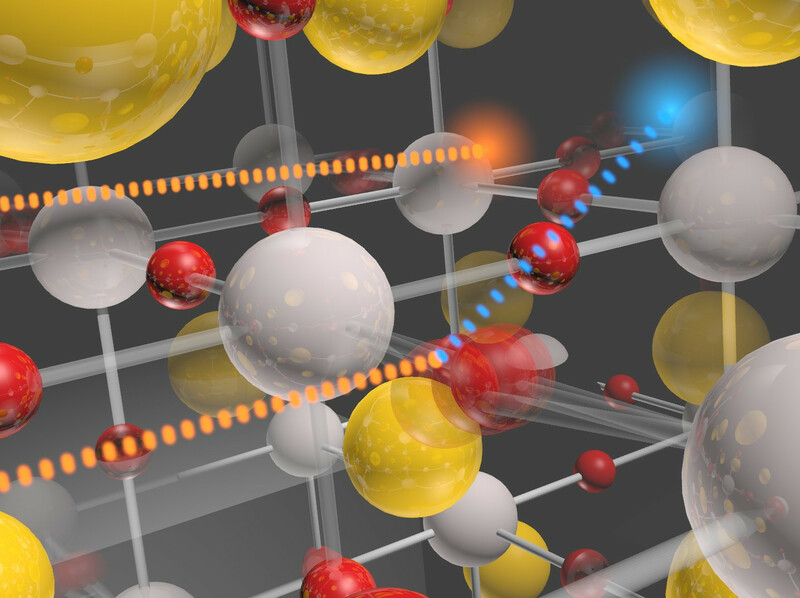 We have also investigated the bulk materials themselves, without the presence of an interface, as many of these perovskite transition-metal oxides are largely unexplored in the literature. Here our efforts have focused on the mechanisms determining carrier mobility, band gaps, charge localization, and the behavior of defects. Copyright © 2009-2015 The Regents of the University of California, All Rights Reserved.